Watermelon Obsession: Unlock the Key to Health! Are you watermelon obsessed? Do you love gulping down this fruit in all forms? If yes, then it’s great news for your health! 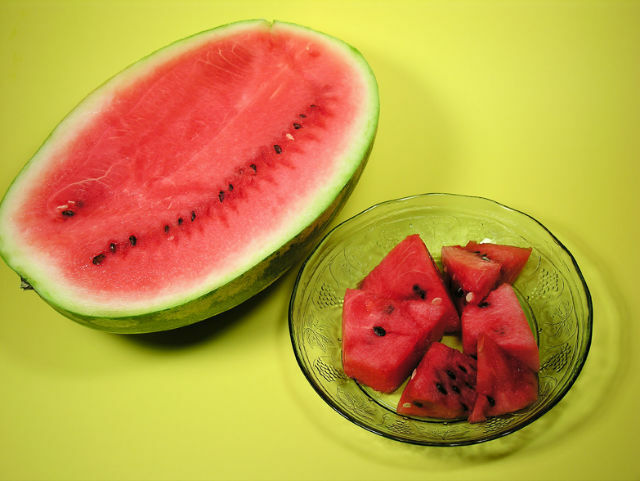 A storehouse of vitamins and minerals, watermelons keep your heart and nervous system in blooming health. This red fruit is essentially a summer crop but is now available almost throughout the year in the grocery stores. Juicy, sweet, and succulent, watermelon juice can be the apt energizing drink during hot summer days. Around 93% of the fruit comprises of water, which helps to overcome state of dehydration. Health experts confirm that watermelons are fat-free and cholesterol-free, besides being rich in Vitamin A, Vitamin B6, Vitamin B1, Vitamin C, and health fibers which are good for the functioning of the heart and the nervous system. Presence of Vitamin A in this fruit is good for eye health and keeps night blindness at bay. However, it is lycopene that is the most talked about nutrient in watermelons. Research suggests that lycopene is found in almost all red fruits except strawberries and is beneficial for resisting the occurrence of prostate cancer, and heart diseases. This red antioxidant traps cancer-promoting agents called free oxygen radicals. These free radicals oxidize cholesterol and make it stick to the walls, thus increasing chances of strokes and heart attacks. Antioxidants exercise control over these free radicals to help prevent the onset of fatal diseases. The antioxidants in watermelon have been found to minimize the onset of fatal diseases like asthma, atherosclerosis, diabetes, colon cancer, and arthritis. Fitness freaks can easily find their staple diet in watermelons since it has low calorific value and high nutrient density and water content. So while you burn your calories in the gym, you can follow it up with a cool watermelon drink. Watermelons make excellent pudding, cakes, pies, salads, pickles and a whole lot of snack items. These items can be included in your daily diet without much ado. And if you still find preparing these dishes a lot hectic, just consume them raw; they are still tasty! Watermelons are hot favorites with the Americans and those who still keep aloof from it, are keeping their body from useful nutrients. Hope you now know why being watermelon obsessed isn’t so bad an option! Suzanne Macguire is a professional content designer with expert knowledge in nutritional science. Her recent articles cover a lot of information on interesting watermelon facts. Next articleDoes Coffee Have Any Antioxidant Benefits? Hey Buddy!, I found this information for you: "Watermelon Obsession: Unlock the Key to Health!". Here is the website link: https://www.thealternativedaily.com/watermelon-obsession-unlock-the-key-to-health/. Thank you.